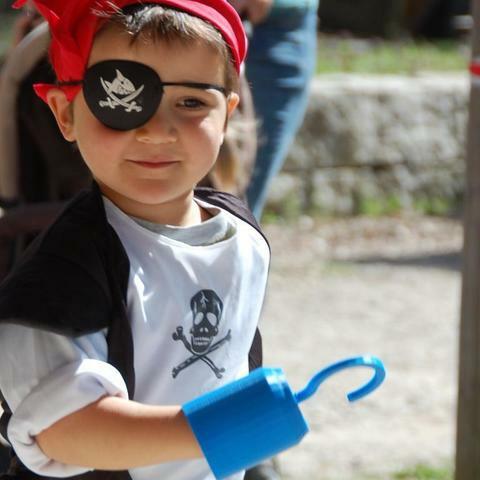 This is a parametric pirate hook I made for my son's birthday party. It fits the paw of a 4-5 year old very well. It consists of three prints, the cup for around the hand, the hook, and then the grip and joining piece. My son really likes it, although the hook is a little primitive. I've included the SCAD. The cup file is parametric, and while not greatly laid out, it should be easy enough to scale up or down. Its also relatively tall, and could easily be shortened by a centimeter or two. The other files are not parametric, because I was in a hurry, but they should be easy enough to adjust. Simply print all three parts. Then dry fit the grip, hook and joining bracket. Then make sure the hook passes through the cup hole. Finally use glue to assemble the whole thing more permanently.